- INDE – Dholavira - The 5,000-year-old Harappan ruins of Dholavira in Kutch have the capacity to rewrite an important portion of the history of theatre of the world. Until now, it was believed that Greek and Roman theatre, with their amphitheatres and poignant plays, were the oldest in the world - dating back 2,500 to 3,500 years. But, archaeologists who excavated Dholavira say they found remains of what can be the world's oldest stage. Well-known archaeologist R S Bisht, who is credited with excavating Dholavira, says, "We found a multipurpose open field which must have been used for everything, from sports like wrestling and bullock cart races, to plays." The field is 283 metres by about 45 metres and is placed between a citadel or what is known as the upper town, and the middle town in the ruins. Yadubirsingh Rawat, director of Gujarat government's department of archaeology who was part of Bisht's original team, adds, "You can call the field 'rangbhoomi' or arena or stadium. We found steps around it which were used as stands for the audience. Also, they seemed to be adding a new layer of mud to the field every year. The mud was imported from outside Dholavira." This layering gave the stage unique acoustics and sonorous quality. Adds Bisht, "The stands had gates with stones that look worn out, as if bullock cart after bullock cart had passed over it. The stadium was a very popular part of the Dholavira settlement." One corner of the field has a smaller stadium which could have been the green room where performers dressed up before walking onto the main stage. It could also have been used for exclusive shows for the royalty of the time. "We excavated a small two metre by two metre portion of the field and found it was scattered with hundreds of jewellery beads," Bisht says. "You can imagine performers decked in beads from top to bottom, freely dancing and the beads falling everywhere- The excavators also found row after row of peg holes, which may have been used to erect temporary stalls and dividers during performances. - EGYPTE - Qantara - Looters have pillaged a number of warehouses containing ancient Egyptian artifacts, stealing and damaging some of them, archaeologists and warehouse workers said on Monday. A group of looters attacked a warehouse at the Qantara Museum near the city of Ismailia on the Suez Canal that contained 3,000 objects from the Roman and Byzantine periods, a source at the tourism police said. Many of the objects had been found in Sinai by the Israelis after they occupied the peninsula during the 1967 war with Egypt, and had only been recently returned to Egypt. A worker at the warehouse said the looters had said they were searching for gold. The worker told them there was no gold but they continued to pillage the storehouse, smashing some items and taking others. An archaeologist said warehouses near the pyramids of Saqqara and Abu Sir were also looted. "At other locations, guards and villagers were able to successfully repel gangs of looters," the archaeologist said. On Friday, looters broke into the Cairo museum, home to the world's greatest collection of Pharaonic treasures, smashing several statues and damaging two mummies, while police battled anti-government protesters on the streets. The culture, monuments, temples and pyramids of ancient Egypt have left a lasting legacy on the world and are a major draw for the country's tourism industry. - NORVEGE – Stjordal - - It looked to be a routine excavation of what was thought to be a burial mound. But beneath the mound, archaeologists from the Norwegian University of Science and Technology’s Museum of Natural History and Archaeology found something more: unusual Bronze Age petroglyphs. "We believe these are very special in a Norwegian context," says museum researcher and project manager Anne Haug - The excavation in Stjordal, just north of Trondheim, was necessitated by the expansion of a gravel pit. Given that project archaeologists didn’t anticipate that the dig would be very complicated, the museum researchers dedicated just three weeks to the effort. Then came the surprises. First, it turned out that mound builders had used an existing hill as a starting point - which of course saved them time and effort. The hill itself made the burial mound even larger and more monumental than it might have otherwise been. But researchers suspected there might be another reason for the choice of the hilltop when they uncovered the remains of two cremations, or rather a fire layer that also contained bits of bone. Underneath they found many petroglyphs, including eight drawings showing the soles of feet, with cross hatching. There were also five shallow depressions, Haug says. Two boat drawings and several other drawings of feet soles with toes were also found just south of the burial mound. “This is a very special discovery, and we are not aware of other similar findings from Trøndelag County,” she says. “The tomb might have been deliberately constructed over the petroglyphs, probably as part of funeral ritual. Based on the type of characters and especially the drawings of the foot soles, we have dated the artwork to the Bronze Age, about 1800 - 500 BC.” “Why there are foot sole drawings beneath the tomb is a puzzle. But if we interpret the find in terms of a fertility cult, it may be that the soles represent God and life-giving power. That means that you can have both life and death represented in one place,” she says. 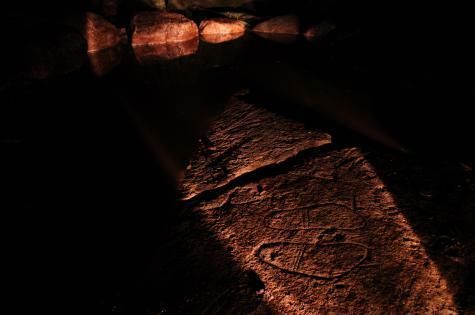 Haug says that there was a similar discovery in Østlandet, an area called Jong in Bærum, where petroglyphs illustrating foot soles were found under a tomb that dates back to the Bronze Age. In a Nordic context, this phenomenon is more common, and there are several examples where burials were combined with rock art, particularly petroglyphs of foot soles from Bohuslän, a World Heritage site in Sweden. - CANADA – Arctique - Nunavut archaeological sites threatened by climate change may be saved thanks to new high-tech equipment, says the territory's director of culture and heritage. Doug Stenton said new 3D technology and a ground-penetrating radar system can be used to quickly map the surface and sub-surface, and could be used to deal with sites affected by coastal erosion and melting permafrost. there are about 12,000 documented sites in Nunavut, dating back as many as 4,500 years. Discoveries can include stone tools, clothing, bone and stone carvings, and masks. As an example of a threatened site, Stenton pointed to photos of a site containing artifacts from the Tuniit or Dorset people, who predate the Inuit. A large section of the site near Pond Inlet, Nunavut, has washed into the ocean. "This is one example of the kind of erosion that we see at the sites and the kinds of things that we're going to have to probably pay more attention to as a consequence of climate change, global warming and melting of permafrost."